If you are looking for the best tele lenses around, you don't really need to look further than Canon. And ever since the original Canon EF-S 55-250mm f/4-5.6 IS, this also applied to the budget class. 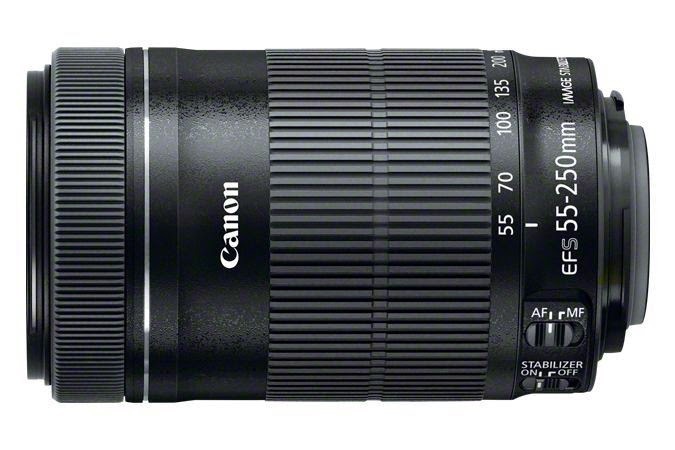 After a rather cosmetic mk II refresh, Canon has released a more substantial update last year - the Canon EF-S 55-250mm f/4-5.6 IS STM. Now upon first glance this may appear to be almost the same thing but it actually isn't. The optical design has been changed from 12 to now 15 elements and there's the new STM drive - thus Canon's AF stepping motor. The field-of-view of this APS-C lens remains equivalent to 88-400mm on full format cameras which is certainly sufficient for the vast majority of amateurs out there. Ambitious users may not like the slow max. aperture but you can't have it all in this price and weight class. There was a time where such "kit grade" lenses used to be pretty crappy in terms of build quality but during recent years the mechanical quality improved quite a bit in this class. Sure, the EF-S 55-250mm f/4-5.6 IS STM is still not build like a tank but the plastic quality is fairly decent and the tolerances are tight. The beauty of the plastic mount may be a bit debatable but it's not a heavy lens anyway. The focus and zoom control rings operate reasonably smooth. Typical for such lenses it extends when zooming towards the long end of the zoom range (see the product images below). Neither the front element nor the focus ring rotate during focus operations which is an improvement over the first version. Size- and weight-wise the (APS-C) lens is about 30% smaller/lighter compared to the EF 70-300mm f/4-5.6 USM IS (full format) which may be an argument for some. As mentioned, the lens benefits from Canon's latest AF technology - a stepping motor (STM). STM tries to combine the best of both worlds - that is providing speed both in phase- and contrast-detection AF. Conventional USM lenses don't really perform well in contrast-detect mode (aka life-view mode) whereas STM overcomes this limitation at least when used with the latest generation of APS-C DSLRs. Other than delivering a snappy performance, AF operations are also essentially noiseless. On the downside - at least for the more conservative fellows among us - STM also means manual focusing "by wire" thus you actually trigger the AF motor by turning the focus ring. This feels somewhat detached, yes, but actually it works just fine. Other than the STM, we shouldn't forget the Image Stabilization, of course. It is good enough for a "gain" equivalent to up to 4 f-stops but as usual we'd like to advise not to stress this to the max.